Editor's note: This feature originally appeared in the March issue of DS News , out now. 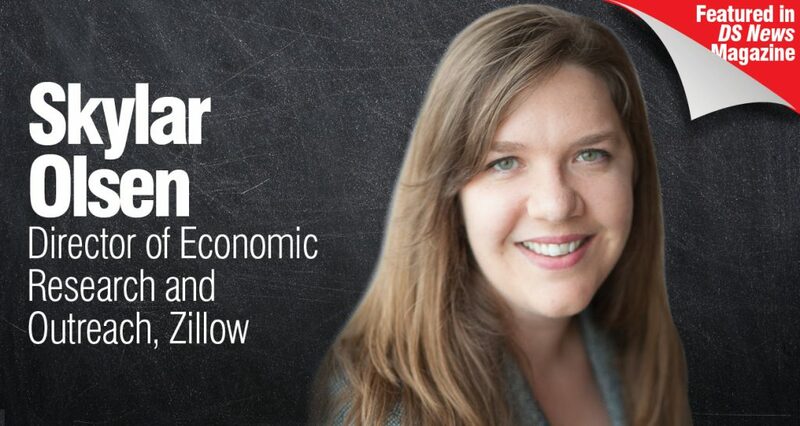 Skylar Olsen is the Director of Economic Research and Outreach at Zillow. She investigates housing markets all across the country and the importance of place in economic outcomes. Olsen is also dedicated to sharing housing data with policymakers as well as academic and nonprofit researchers to further understanding on a whole host of issues. She holds a Ph.D. in economics from the University of Washington, specializing in econometrics and environmental economics and was honored for teaching excellence by the University of Washington. 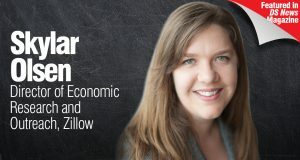 Olsen spoke to DS News about the trends in the housing markets, the homelessness crisis, and what she loves most about being an economist. What does your day-to-day role look like as Director of Economic Research and Outreach? As a housing economist at Zillow, I and my team have access to the richest housing and consumer dataset in the world. With that dataset at our fingertips, we keep an eye on economic and policy developments in the news, and through the grapevine, and perform analyses to comment on those rising issues. But we also are constantly brainstorming deeper and more complicated questions we can explore, such as, how do rising rents impact homelessness or what impact do land use regulations have on home prices and our ability to build. We have a sense of humor too though looking at the best places to move for love or hot markets for dogs. Personally, I spend some of my time playing in the data, some of it managing and guiding others, a small chunk of it vision setting, and a fair share simply talking about all the insights we’ve explored, whether on a stage or on the phone with a reporter. What are some of the markets poised for homeownership growth this year? I expect to see homeownership rates rise in places where housing is still affordable, but have good job prospects. Southern markets like Dallas and Atlanta still have fairly affordable homes, but really strong job markets–so people are earning enough to buy a home, and the homes themselves are within their reach. With properties getting more expensive, it's taking longer for consumers to save for a down payment. How will this trend play out for millennials who are struggling to become homeowners? Millennials are facing the one-two punch of rising housing costs and record levels of student debt. We just saw a Fed report that about 400,000 young Americans didn’t buy a home because of student debt. The homeownership rate for young people, despite a recent turnaround, is far from reaching the level it was at in the early 2000s, before the housing bubble. Home values are still growing faster than incomes, and our research shows that the median household income often isn’t enough to break into the housing market. So, already you need to be at a higher income bracket than the average household. Another challenge is that lower-priced inventory is in higher demand, so while the more expensive price range is less competitive, there’s still plenty of competition for affordable homes. This could mean multiple bids, escalation clauses, and a lot of stress for first-time buyers, though with the market cooling down this means buyers should be able to make a calmer more considered decision. The best thing first-time buyers can do is to be super educated about the market and their own finances and work with great professionals who can help guide them through the process. What are the major barriers to homeownership in the current housing market? Affordability is the number one challenge, and it comes from a few different angles. Home prices are outpacing income gains, and that puts homeownership further out of reach for hopeful buyers. Rents have essentially leveled off or even dipped slightly, but they’re at or close to record highs, which makes it harder to set aside money to save a down payment. There is a bit of a positive though, in that mortgage rates have come down from the heights they reached late last year, so once you get a home, your monthly costs won’t be as high. Low inventory, especially at lower price points, is keeping upward pressure on the housing market, too. Some of the most inventory deprived markets–like Seattle–have seen a recent resurgence in the number of homes for sale, which has slowed the frenetic pace of sales. If this trend spreads across the country, buyers will have more breathing room. The most rewarding aspect of my job changes from day to day. I love working with my team supporting their career development and imagining what we together can be or do. I like it when research we’ve done starts spreading through the media and the community or when someone I meet outside of work tells me about something interesting that they’ve heard or read, and it’s the work we did. If we can take a complicated topic, such as housing vouchers and affordable housing supply, and break it down into clear parts, policymakers can work with that to inform changes. Sometimes they do, and I can see it happen.